Virginia is considered the best state for business by Forbes.com, but ranks No. 5 in the estimation of financial network CNBC. The commonwealth is home to one of the biggest banking companies in the country, McLean-based Capital One Financial Corp., but the rest of the banks based in the commonwealth are relatively small community banks. Virginia has three hospitals with annual net patient revenue of more than $1 billion, but two of them, VCU Health System and the University of Virginia Medical Center, say they face big income cuts without the expansion of Medicaid. Half of the 10 largest accounting firms in the commonwealth have their biggest office in Washington, D.C., suburbs while the majority of the state’s top 10 law firms have their main office in Richmond. 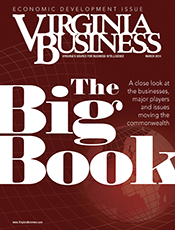 Those are just a few of the facts found in this edition of The Big Book, Virginia Business’ comprehensive look at trends and major players in the economic development of the commonwealth. The magazine has tracked the progress of leading companies in a variety of industries since the 1990s. Beginning last year, however, Virginia Business cast its net wider, pulling in additional information in nearly a dozen areas. Economic development charts tracking the state’s biggest deals in 2013, trends in international investment in the commonwealth, cargo growth at the Port of Virginia and the state’s various rankings as a good state to do business. The listings of Virginia’s largest public and private companies, its fastest-growing firms measured by Inc. magazine and the Virginia Chamber of Commerce’s Fantastic 50 program plus a look at CEO pay at state-based corporations with at least $1 billion in revenue. A look at enrollment at Virginia’s four-year public and private colleges and state community colleges plus a peek at the endowments at a number of schools in the commonwealth. Charts ranking Virginia’s top firms and companies in construction, commercial real estate, banking, insurance, health care, accounting, law, tourism and many other fields. Taken together, the section offers an overview of what makes the state economy hum.